As often occurs in the art world, the paths of Askin and Kimball eventually converged, leading to a lasting friendship and several collaborations. 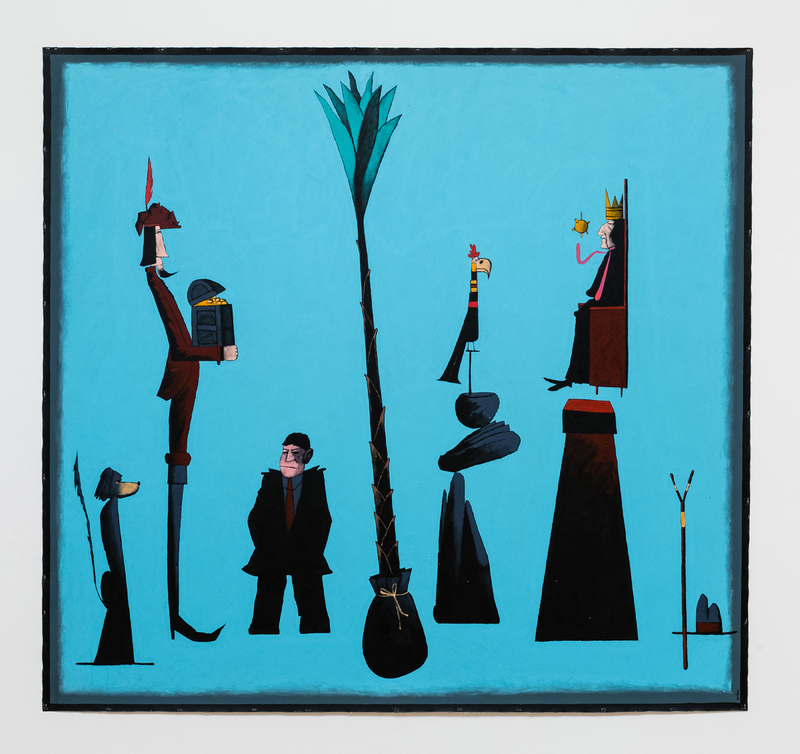 Visitors to the exhibit Reality Reorganized, now at the BYU Museum of Art, will quickly discover that the artists are kindred spirits who celebrate humor and whimsy in their artworks. “Random, playful, and lighthearted” are additional descriptors one could easily append to a review. This is certainly no stuffed-shirt display of ”Contemporary Art.“ Personal interpretation of each artwork is not only welcome, it’s expected. It is true that all works feature titles and traditional curated descriptions. But the thoughts posted near the entrance say it best: “Searching too deeply for one certain meaning in [these] pictures … may lead you astray.” In other words—don’t jump to conclusions. Just enjoy. “Reality Reorganized” aptly describes Askin and Kimball’s use of motifs and common objects. For instance, Askin places the figure of Rembrandt in one painting, only to repurpose that figure as a banjo-playing mechanic (“Rembrandt’s All-Night Garage,” 2015). This type of humor and absurdity abounds in both men’s artworks, including in the works’ titles. Some are laugh-out-loud funny—Kimball’s “Bearded Man with a Headache This Big” or Askin’s “Christopher Columbus Returns from the New World with the Four Basic Food Groups to Queen Isabella Levitating and Oskar Kokoschka in a Funk”, for example. The wit conveyed through such literal descriptions is at least half the fun, well-matched to the vibrant hues and quirky motifs in the works themselves. Of course, each artist shows decided preferences in medium. Askin most often uses acrylic on canvas or paper, whereas Kimball prefers the lithograph nearly exclusively. The only exceptions are the few collaborative works by both artists and some three-dimensional pieces by each. Similarly, each artist leans toward a recognizable color palette. Most of Askin’s paintings feature bright colors such as turquoise blue, burnt orange, burgundy red, black, and lime green. Possibly due to challenges inherent in the lithograph process, Kimball’s palette tends more toward mustard yellow, rustic terra cotta, cerulean blue, mossy greens, and neutrals like gray, brown, and tan. Several of Kimball’s works merit more detailed discussion here, mostly because they are emblematic of his style. For instance, in “The Artist Mounted on Horseback” (1984, lithograph), Kimball’s literal portrayal of a classical head mounted against the back of the horse’s neck speaks volumes about the artist’s sense of humor. As the horse gazes left and the head gazes right, the pole on which both are situated draws the eye down to the pedestal base—which sits on top of a pair of rocking chair runners. Two of the artist’s other paintings also feature horses and classical stone heads, namely “Portraits of a Man and His Horse, the Horse Having Bitten the Man” (1996) and “An Emperor and Someone Else’s Horse” (2007). In the latter work, Kimball humorously features the head of Emperor Constantine, once mistaken for Marcus Aurelius in a famous equestrian portrait. Throughout Kimball’s featured works, he references motifs such as birds, horses, zebra or tiger-skin rugs, Roman busts, and palm fronds. These motifs are commonly shown in the lithographs and three-dimensional works (e.g., intricate wooden boxes and shadow-box displays). Like Kimball, Walter Askin also enjoys the juxtaposition of history and fiction, imagination and reality. His works regularly feature symbolic objects or totems. These emblems are sometimes natural objects, sometimes animals and—occasionally—creatures that seem part human, part machine. In “Oscar Wilde at the Swap Meet”(1996), Askin juxtaposes the extravagance of Oscar Wilde (partly hidden behind a sumptuous curtain on the right) with the decidedly unglamorous atmosphere of a street fair on the left, complete with ribald dancers and street vendors hawking their wares. 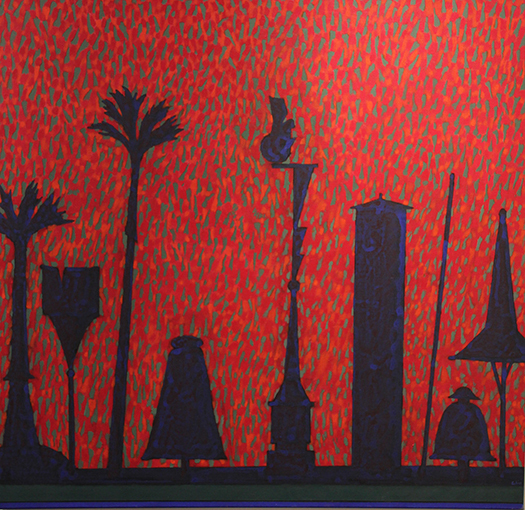 By contrast, “Totems for Seurat” (1988) imitates Seurat’s famous pointillism style with vibrant bursts of red, green, and orange in the background, against which dark silhouetted totems stand in dramatic relief . Nearby, “Good and Evil” (2004) portrays an eerie, floating figure of a man wearing a suit and bowler hat, hovering through an open window. To the right a closed window pane reveals an ominous black, faceless figure presumably seeking entrance. In between these mysterious figures sits a man, painted in gray, sitting with a resigned expression on his face, as if awaiting the inevitable. Least typical of Askin’s featured works is a three-dimensional “Theater” (no date) which features moveable stick players within a wooden cupboard. The moveable characters hint at infinite possibility while the whole work compares artifice against reality. For this reviewer, the highlight of the show is “Grape Crusher Modified” (2015), a collaboration by Askin and Kimball. One can see the hand of Askin in the humorous figures of grape dancers/crushers, as well as the stylized, twisting pencil on the right side. The orange polka-dot walls, caricatured faces, and vibrant coloring may also reflect Askin’s style. But—as the work is part lithograph, part collage—Kimball’s hand is fully evident as well. The top ”layer” is a brightly colored portrayal of a calm (perhaps tired) figure stomping grapes in a bath. The second layer is a pen and ink drawing of a frenetic, even panicky, grape crusher mostly hidden from view except for his head and arms, which flail about while droplets of juice splash in every direction. Intriguingly, the bottom layer is left unpainted. Neglecting this exhibit would indeed be a shame, since every art lover—even those who typically avoid contemporary art—will delight in the absurdity, comedy, and unbounded fun of this show. “Reality Reorganized: Walter Askin and Wayne Kimball’s Mysterious Discursions,” BYU Museum of Art, Provo, through Aug. 27, moa.byu.edu. This review appeared in the June 2016 edition of 15 Bytes.